Install our clipboard tool and you will never lose data once copied. This clipboard manager runs on Windows startup and records everything placed in the clipboard into the database. You can always view the multiple copied clips, copy the item back into the memory or insert it into an application. Everything you have to do is press the "Ctrl D" key combination or choose the program icon in the system tray. 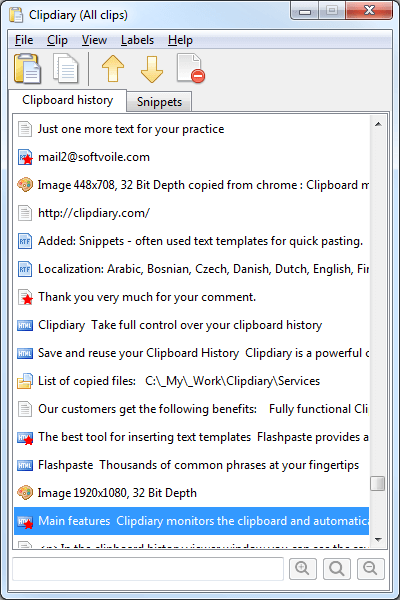 Install our clipboard history manager and you will never lose data once copied. This clipboard manager runs on Windows startup and records everything placed in the clipboard into the database. At any moment, you can view the clipboard history, return the item back into the memory or insert it into an application. Everything you have to do is press the "Ctrl D" key combination or click the program icon in the system tray. ClipExact runs in the background while you are working. Whenever you copy text to the clipboard, it strips off the formatting. That sounds very simple but it can save you a lot of time when pasting text between different applications (eg Word into Outlook) when all you want is the text to be inserted with the style of the destination app. You can restore formatting or temporarily dsable ClipExact from the system tray icon menu. ClipHint 2.3 allows you to modify formatted or unformatted text before you paste it into an application. It may display a hint of the current item in its Taskbar button label. It stores many Clipboard items and restores them upon program start. It includes incremental searching, launching, merging and splitting of items. These searches may be typo-insensitive. ClipMagic is a powerful Clipboard Extender and Information Manager for recording, storing and sorting text and images, either automatically or manually, with special features for recording URL's if the text is from an Internet site. To save an item you simply copy it to the Windows clipboard by pressing CTRL-C. ClipMagic then automatically stores it, and if you have set up Rules and Filters the clip will be moved into a pre-defined category.